“I have always been ‘a walker’. When I started walking with the Moorland Ramblers we sometimes encountered finger posts saying ‘the Mariners Way’. Being curious, I asked what it was but nobody could tell me! I did some research, attended a talk by John Risdon at Torquay Museum last year and decided to do my own route. To make it more of a challenge I planned to walk on my own, carrying all my needs in a rucksack. Recently retired, I used to work closely with Rowcroft during my hospital work as a Palliative Care Nurse Specialist. 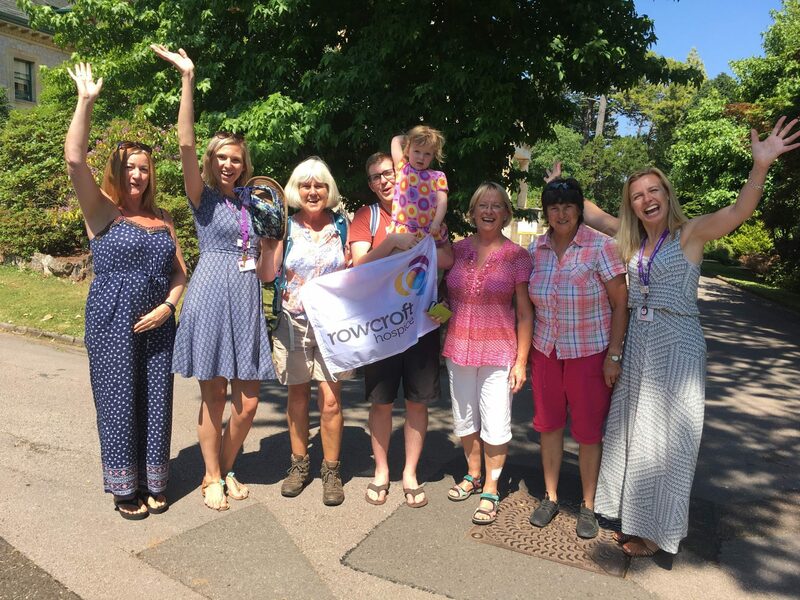 I decided to make my walk a fundraiser for Rowcroft Hospice as I feel it is a vital asset to our Community. I wanted to start and finish at Rowcroft, staying overnight in B&Bs. Because my route would take me to lesser populated parts of Devon I needed to ensure I had somewhere to sleep. I estimated how many miles I could walk in a day (start at 9, finish at 6 pm) and checked the OS maps for stopping places. My first booking was at Lowertown Farm and after that, bookings all fell into place easily. Little did I know in March that I had chosen the hottest week of the year…. I took the train to Barnstaple and walked the 10 miles to Bideford, the start point of the Mariners’ Way. Day 2 was 17 miles from Bideford to Meeth, day 3 13.4 miles from Meeth to Okehampton, Day 4 was 17 miles from Okehampton to edge of Chagford, day 5 13 miles to Lowertown, day 6 to Totnes=15.5 miles, day 7 to Dartmouth 15 miles and day 8 the final 14 miles back up to Rowcroft Hospice! The TOTAL was 115 miles and ascent 11,420 ft. (climbing with heavy backpack) Phew! The best bits – the support I had from my family and friends and meeting lots of wonderful people on the way. Walking across Hameldown (Widecombe) in a cooling breeze with amazing views and no flies was a real highlight. The worst bits – getting blisters on the first day, various types of flies but in particular horseflies (they are in a class of their own!). Not being able to open the bedroom window in one B&B and no slippers to wear after walking all day. Funniest bits – being knocked backwards by a branch, landing stranded between boulders on my back, weighed down by my rucksack, with legs and arms waving in the air. I also developed a special Horsefly Dance with my map and hat!